Designed for wine collectors with serious wine storage requirements in a more rugged storage environment. Long-term aging cabinets for maintaining ideal storage temperature between 55º to 58º F and relative humidity from 50% to 70%. 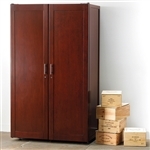 LE CACHE Wine Vault 3100 Basic Door shown in Classic on Cherry finish.